For more information, please visit Sublime Books. This book has 18 adorable designs for babies from birth to 3 years using a palette of soft and pretty blues, lilac and yellow with a smart navy blue – simply gorgeous colours designed to create the most Sublime little garments and exquisite blankets for the home. There’s an emphasis on easy knits with Sublime design twists to create individual style – we’ve used clever rib stitches to create an adorable pleated look on cardies for girls and to shape the neckline on sporty little sweaters for boys. There are some really easy cables on boy’s sweaters and girl’s cardies with blankets to match. If you like to knit on the go, there are sumptuous patchwork blankets made from handy sized squares, in the most Sublime colours. Each piece has been designed using exquisitely soft Sublime baby cashmere merino silk dk. This reassuringly delicate and smooth yarn is the gentlest natural blend next to your baby’s skin and provides the ultimate cosiness for your little ones. Here at Sublime we know the importance of having your little one clothed in the most adorable designs, that are also incredibly soft next to your baby’s skin. We have added some beautiful bold baby brights to the Sublime Baby 4 Ply palette. These combined with stunning neutrals lend themselves to creating the most gorgeously classic knits with a modern Sublime edge. In this collection there is the cutest little sailor sweater design for boys, it comes in two gorgeous stripey versions. Then there is the Love Story Collection for girls, a cardie and blanket patterned with beautiful little hearts. As well as these stunning knits there are classic little sweaters, bootees and cardies that we are sure will stand the test of time. There is something utterly irresistible about baby knits and they are all the more special if they are made by hand. So much love and care knitted into every stitch. 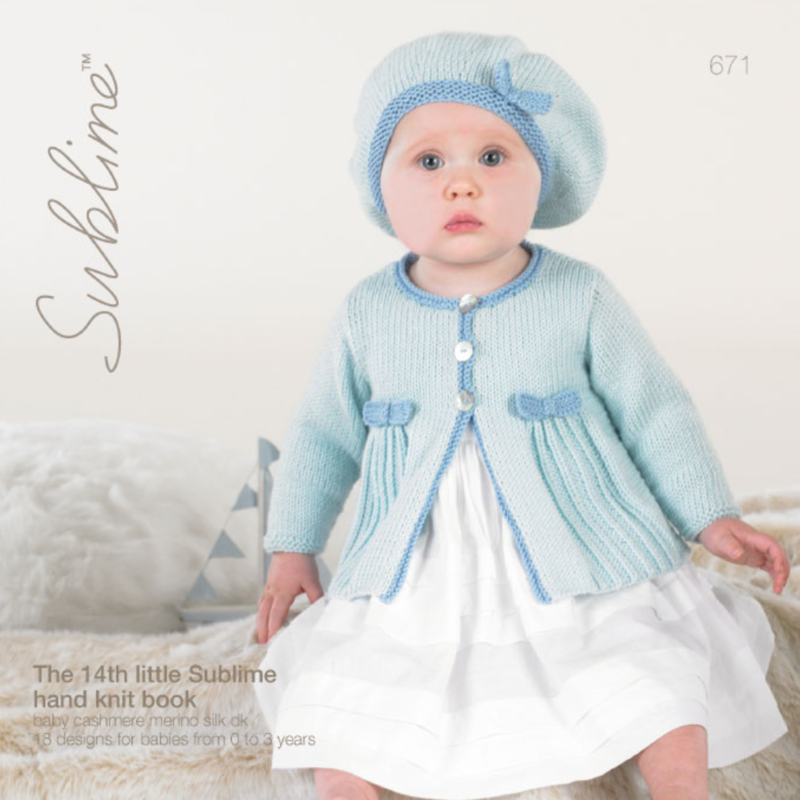 Using an exquisite Italian yarn made from the highest quality natural fibres, Sublime have created the most adorable range of knits for your baby’s wardrobe. Each piece has been designed using Sublime baby cashmere merino silk dk. This reassuringly delicate, soft and smooth yarn is the gentlest, natural blend next to your baby’s skin. With emphasis on the ‘quick and easy to knit’ the designs are essentially simple knits with a little design twist to give them individual style. Knit them as a gift for that new little person in your life. There is nothing more perfect to wrap your most precious of possessions in than Sublime baby cashmere merino silk dk prints. Sublime baby yarns are renowned for being unbelievably soft and delicate next to your babies skin. Sublime baby cashmere merino silk dk prints is spun for Sublime in Italy from a beautifully soft blend of extra fine merino wool, silk and cashmere. It comes in a gorgeous palette of softly printed baby shades. The Sublime design team has created a collection of truly adorable designs for little boys and girls from birth to 3 years, they are designs that are perfect for those occasions when something just that little bit more special is required. For little girls there are lacy cardies finished off with pretty bow fastenings, the sweetest pinafore dresses and the cutest ballerina style cardigans. The for the little boys there are gorgeous cabled styles, textured knits and a beautiful blanket for the most perfect of nap times. Sublime baby knits have an unrivaled beauty. We have taken the gorgeous yarn that is Sublime Evie and added some of the most stunning colour combinations to create Sublime Evie Prints, a yarn that in our eyes is truly special. Sublime Evie Prints has the same stunning blend as Sublime Evie, it comes in a range of gorgeous printed shades that create an effect that is quite simply breath-taking. In this design book the Sublime design studio have selected shades from both the Evie and Evie Prints colour palettes, they are shades that compliment each other beautifully. We have created a collection of gorgeous designs for women, they are casual pieces that are incredibly stylish and that we just know will leave you feeling wonderful too. There are stunning polo neck ponchos, beautiful kimono jackets, pieces with inter-twinned fronts that are just exquisite and a range of truly gorgeous accessories. The pieces in this collection are not only sensational to wear but they are a sheer joy to knit too. They will bring you pleasure from the moment you cast on. This is a collection that we know you won’t be able to help but fall in love with, so go on turn the pages and let yourself fall in love today. Sublime baby cashmere merino silk dk is made for Sublime in Italy from the finest extra fine merino, silk and cashmere, this beautiful blend creates a baby yarn that is unrivalled in its softness and clarity of stitch. It really is exquisite. In this collection the Sublime design studio has used a palette of wonderfully rich autumnal shades, along with classic neutrals, this combination has enabled us to create a collection of adorable knits that are contemporary, whilst remaining effortlessly timeless. There are the sweetest little matinee coats with heart shaped mock pockets, pretty scalloped edge cardies and an adorable ribbon detail dress, bootees and bonnet set for her. Then for the little chaps there are cute little sweaters, adorable knits with mock pocket detail and the snuggest little duffle coat. If that wasn’t enough we also have designs for three of the most charming toy bears and for slumbers full of love there are some heart motif blankets. This really is a gorgeous collection and one that we hope you take as much pleasure from as we have. Sublime baby cashmere merino silk dk prints is made for Sublime in Italy from the finest wool, silk and cashmere. It comes in the most beautiful range of softly printed baby shades, including pale pastels, as well as brighter, more vibrant ones too. In this Sublime baby cashmere merino silk dk prints collection there are 15 of the most adorable designs for babies. Sublime designs are renowned for giving modern updates to traditional knits, and in this collection we have done that with beautiful patterning, alternative button and bow fastenings and the prettiest of flower details. There are also the sweetest little bunny toys, Mr & Mrs Flopsy. This is an adorable collection and one that we can’t wait for you to enjoy. Sublime Eden caught our imagination immediately with its beautiful swirls of vibrant colour and its delicious blend of wool and cotton which creates a fabric that has impeccable stitch definition whilst remaining incredibly light. The stunning palette of modern, multicoloured shades create an exquisite effect. From the vivid brights of Fauna to the classic neutrals of Anja, there is a shade for everyone. With Eden, the options are endless – knit from one end of the ball and you’ll create a striking block colour effect. Knit from both ends and you’ll see a classic narrow stripe, which our designs show off perfectly. The First Sublime Eden book has designs that you will cherish year-round, from fabulous colour block cardigans and sweaters to colourful wraps and shawls that will add a pop of colour to any outfit, we are sure that all of the knits will certainly make an impact. Colour your life with Sublime Eden.